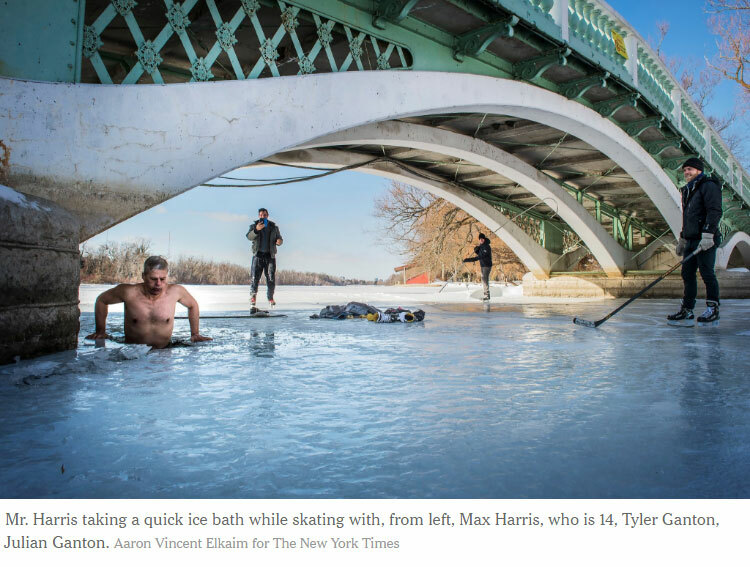 Even for Canadians, it was freezing outside — the city was on Day 9 of a 14-day “extreme cold weather” alert, with the temperature at 8.6 degrees Fahrenheit (-13 degrees Celsius) and going down. City officials were scrambling to open emergency shelters, and warning residents to limit their time outdoors. Who in their right mind would walk across the frozen harbor? By the time the fire trucks arrived, one figure was heading back across the ice, groceries in hand. The other had hurried off to a downtown squash game. “Why did we do it? Because we’re alive!” one of the men, Michael Harris, 54, said a few days later from the warmth of his kitchen across the harbor on Ward’s Island. As it happens, Mr. Harris did have a tough moment as he returned across the frozen harbor with his groceries, falling through some slushy ice to his knees. He was unhurt. 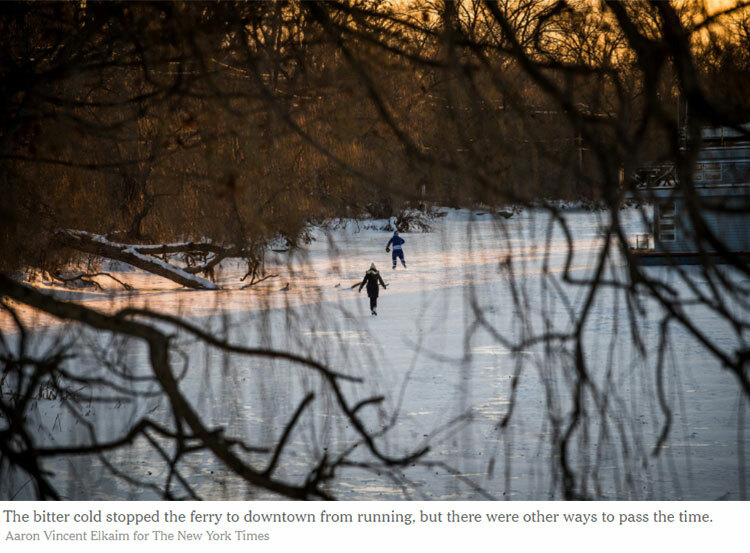 Falling is precisely why the city’s marine police and its harbor master warn against venturing onto the ice, though their big worry is that people will fall right through. Mr. Harris’s mishap, however, did not faze him. He is, after all, a man known to jog bare-chested in the winter and dive through a hole in the ice in search of an errant puck. Mr. Harris, who owns a sales training company, includes himself, if grudgingly, among the Toronto Islands residents he calls “wonderfully nutty.” They aren’t the minority. Eccentricity is part of the DNA of the 620 souls who choose — or get the chance — to live in a rural community smack in the middle of North America’s fourth-largest city. By rural, I mean this: It is not uncommon to come across a coyote or mink while strolling around the archipelago of 14 islands that includes Ward’s Island, just 10 minutes by ferry from downtown. Private cars are restricted here. Instead, local residents travel down the snowy footpaths between their homes on bicycle. 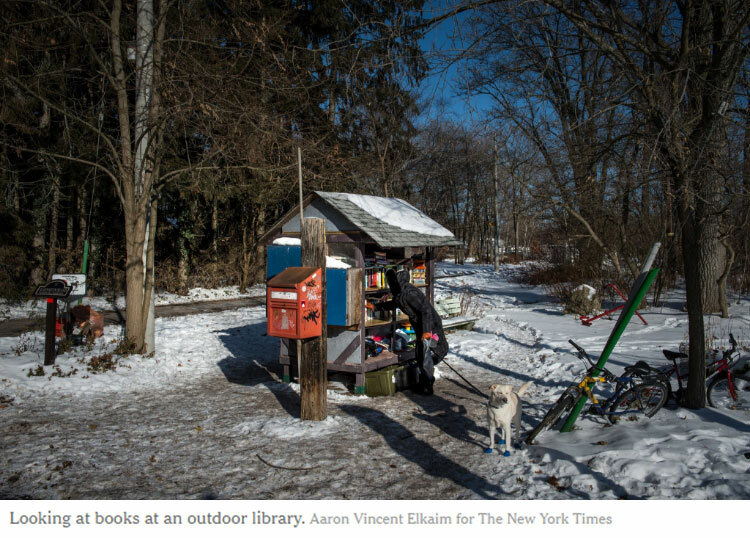 The closest thing to a store is the “trading post” — an open wood shelter where residents leave their castoff books, toys and clothes for neighbors to pick through. If they need booze, or rice, or a light bulb, well, they have to ask a neighbor or head across the lake. It makes for a very tight-knit community of handy, patient and hardy people. There are no movie theaters or nightclubs, so people turn to what’s at hand for fun — nature. Only two of the islands are inhabited, and part of a third is taken up by the city’s small, downtown airport. The rest are city parkland. 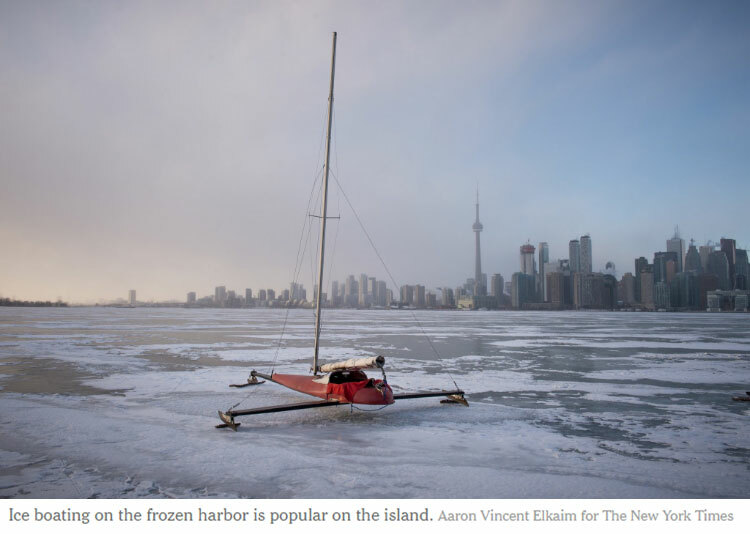 When the temperature is so cold that the entire harbor freezes, that signals “time to go out and play,” said Whitney Webster, a sixth-generation islander, standing out on the frozen harbor before Algonquin Island, the crowded concrete and glass spires of the city’s downtown rising like a ghostly battalion. Mr. Webster, 61, was out walking in the -9.4 degree afternoon (-23 Celsius) when he glimpsed a friend whizzing by in one of two local ice boats. Sure, he was dressed in jeans and leather gloves, but he couldn’t resist. The boom knocked off his hat, and his left hand went numb, but it was thrilling, cutting across the frozen lake in a sail boat rigged with three large blades. The islands were once a sandy peninsula stretching 5.5 miles (8.9 kilometers) out from shore and shielding downtown like a sleeping arm and hand. But in 1858, a big storm cleaved a channel. Then it grew. Since the early days of settlement, the islands have offered an escape from the city — a place where colonists once went to ride horses or picnic. As the city grew, so did the attractions. There was a theater, an amusement park and a baseball stadium, where Babe Ruth hit his first professional home run in 1914. Cottages and tents went up, too, with as many as 8,000 Torontonians moving there for the summer. Mr. Jones made headlines at 75, wakeboarding at a summer festival. He still bikes, and he skates the islands’ lagoons — though not the way he once did, racing against a neighbor who once rowed across the Atlantic Ocean. In 1956, the city’s newly formed metropolitan government announced that it was converting the islands’ residential and commercial properties, all on leased public land, into a park and began demolition. The battle for the community on the two most easterly islands continued for almost four decades. The high point, Islanders will tell you, came in the summer of 1980, when the volunteer home guard’s air raid siren went off, alerting locals that the sheriff was en route with eviction notices. Whisked from their downtown jobs by the “Island Navy” of volunteer boats, hundreds gathered and linked arms across the road to block his route. The following year, the provincial government passed a law allowing the 262 remaining homes to stay put until 2005. Those leases were later extended to late 2092. While the rest of city has seen a real estate frenzy, here house prices have remained astonishingly low because the few sales are overseen by a community trust that both sets the price and selects the buyer from a waiting list, kept at 500. Last year, a tumbledown lakefront house and lease here went for just over $58,000 (72,000 Canadian dollars), while a similar fixer-upper on Toronto’s beachfront rang in at more than one million Canadian dollars. 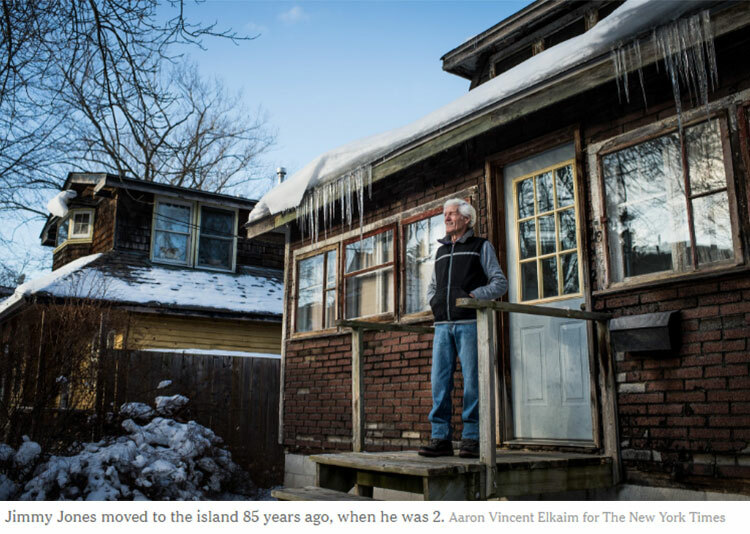 “We are here to care for the island, not to profit from it,” said Elizabeth Amer, a retired editor and City Council member who inherited her mother’s home, and likes to watch the swans navigate the ice from her living room window. That is one consequence of the community trust. Since only one or two houses go up for sale a year, it can take 30 years on the waiting list to buy a house here. By then, many buyers are already into retirement age. The irony, of course, is that the park is the ideal place to be a kid. 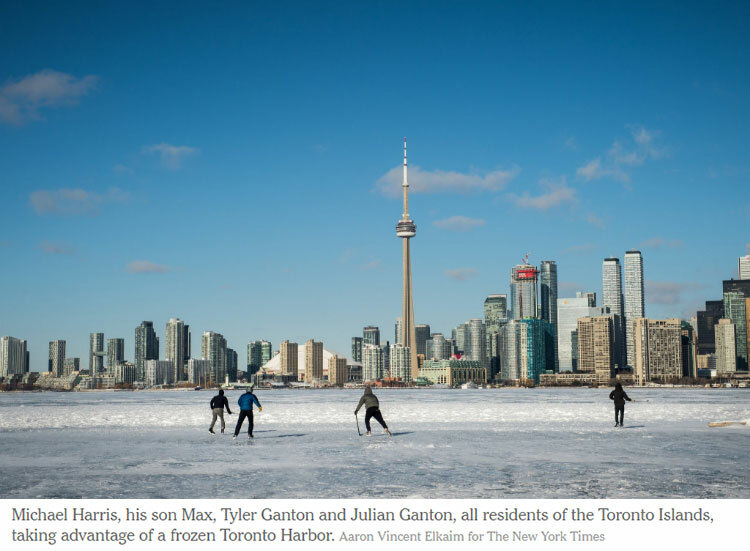 Julian Ganton, now 31, recounted summers spent sleeping in tents high in the trees and winters spent playing shinny — that’s Canadian for pickup hockey — right outside his house. He laced up a pair of skates and climbed down a ladder onto the frozen harbor, where he cut over cracks and frozen methane bubbles. A hockey stick in hand for balance, he pushed off toward the middle of the harbor. Toronto city officials are not the only ones to put out reports on ice conditions. So do the islanders. As a rule, they say that three inches thick is safe to go on, two inches if it is bitterly cold. When Mr. Ganton went out, it was at least one foot thick — 18 inches, in Mr. Webster’s estimation. Even so, the sound of the ice groaning and cracking made Mr. Ganton’s heart jump — with both fear and delight.